The eagerly awaited follow-up to Dragon Quest X is headed to the PlayStation 4, the 3DS, and Nintendo’s upcoming console, the NX. Update: August 4 - 4:00am Square Enix issued a comment to Kotaku regarding the NX release, noting a discrepancy between the event announcement and the press release—head over here to see their statement. Above, you can see a photo of the game’s logo via Famitsu. 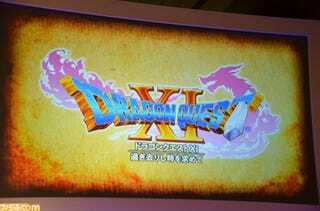 Unlike the online MMO Dragon Quest X, the upcoming entry will be a stand alone single player title. Famitsu reports that the PS4 version is being developed on Unreal Engine 4, with game company Orca pitching in on development. For the 3DS version, Toy Logic will be contributing to development. On the 3DS, one screen shows 3D graphics, while the other screen uses retro style graphics. Dragon Quest X was a Wii, Wii U and 3DS (as well as PC), while Dragon Quest IX was a Nintendo DS game. This is the first main series Dragon Quest game since DQVIII to be on the PlayStation platform. Currently, Dragon Quest XI’s release date is TBA. No word yet on an international release.